Here's a great bit of footage (filmed years ago by yours truly) which I'm sure you'll 'enjoy' of Pete Tinmouth on Peak Technique. It should also be of interest to everyone who doesn't believe me when I tell them the gear's bomber on this route. Forward this to all the climbers out there. After all, who doesn't enjoy watching a good fall? I'm currently sorting out some South America photos to put on here from what is surely one of the planet's most incredible (and relatively undeveloped) bouldering areas, Valle de las Rocas in Bolivia. Prepare to have your mind blown! Thanks to everyone who came to my talk/film show at Climb Newcastle the other night, especially those who came up afterwards and told me they were inspired! That really made my night. It was good to see so many people there and I hope everyone enjoyed the footage of me rolling around in agony. The footage will be online very soon. From hero to zero. Falling off my Back Bowden project. Congratulations are in order for Dan who climbed his project at Badger's Cove while I was away. 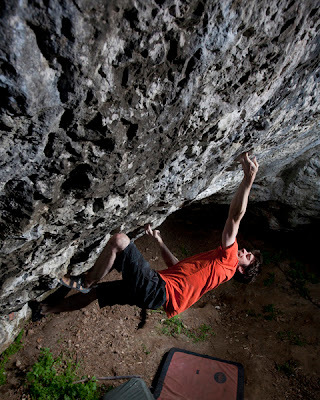 I had a trip there to see him in the early stages of working it when he stuck the crux for the first time. Amazing! Training on Hubble (as you do) obviously worked for those big moves off those undercuts, but Bewilderness is a lot steeper. Work is overwhelming me at the moment and I haven't taken any climbing photos since I got back, but I'm sure the Boliva pics willl make up for it.